What a disappointment! His performance until it is smooth, but of their locked. And when he gave a bug, the reset button is behind it and a small hole! And now? I'm here playing in a parked car and crashes! Where will I get a paper clip or wire to reset? OH NOOOO!!! and then this problem wifi! That anger, I want to see a movie on netflix or youtube, and suddenly the connection error. I've done update, searched the internet for firmware compatible, and so far nothing! 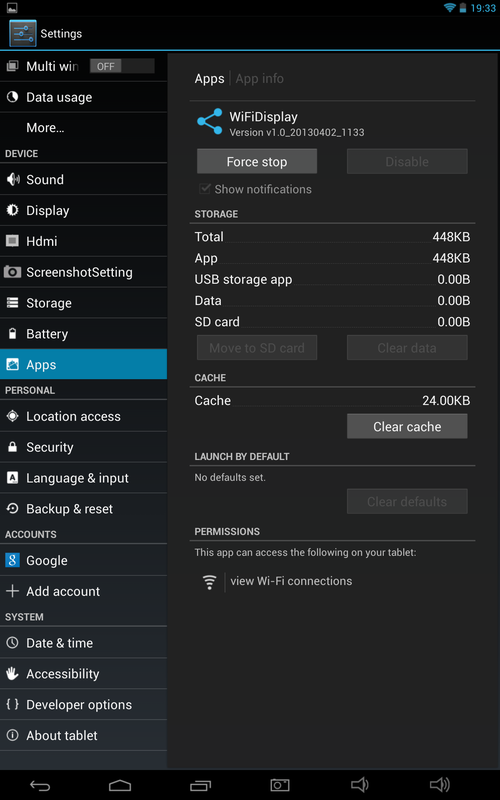 I buy two tablets PIPO M9 PRO with 3G, and both have this problem. The problem is, when I connect to wifi, the tablet works for a few minutes or even hours. And in the notification bar wifi, after a time it shows only upload and not download, and not browse more. I turn on and turn off wifi and do not connect more. I am forced to restart the tablet, and does not always work." seems there is not too much interest in finding a medicine to wifi and to 3g problems . As I wrote in my previous reply under firmware update topics my suspicion is that these problems are somehow connected to the wireless display. 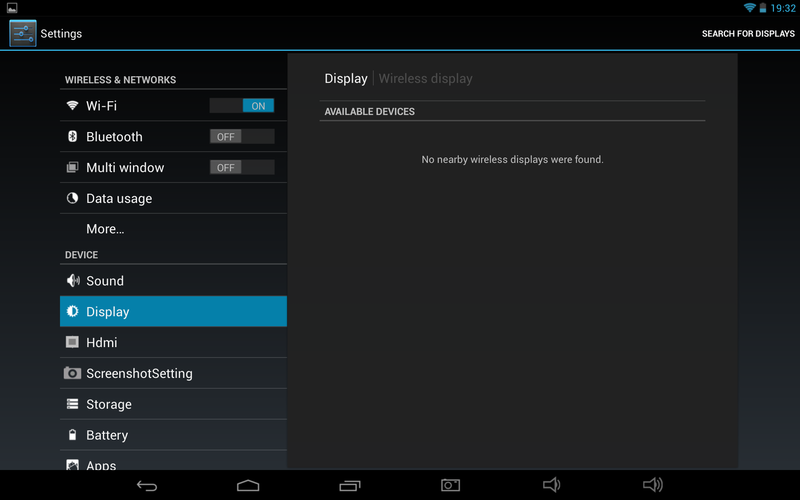 Do you have under "settings - display - wireless display" an option to switch off the wireless display? 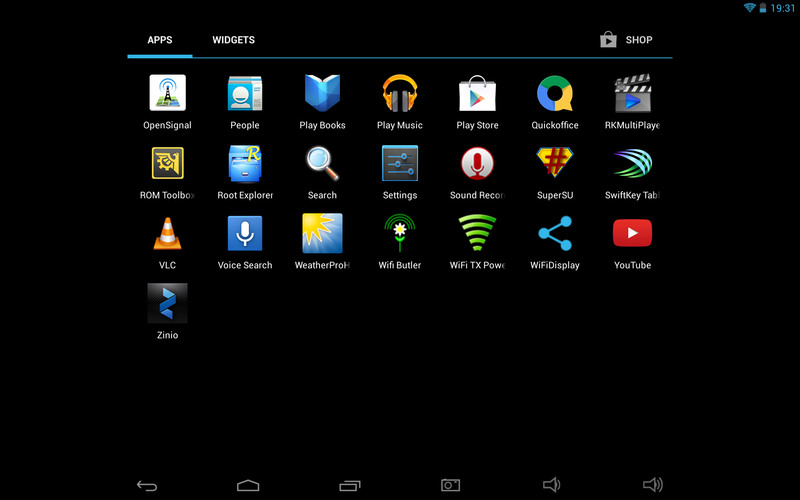 In my tablet there I have never seen such option. 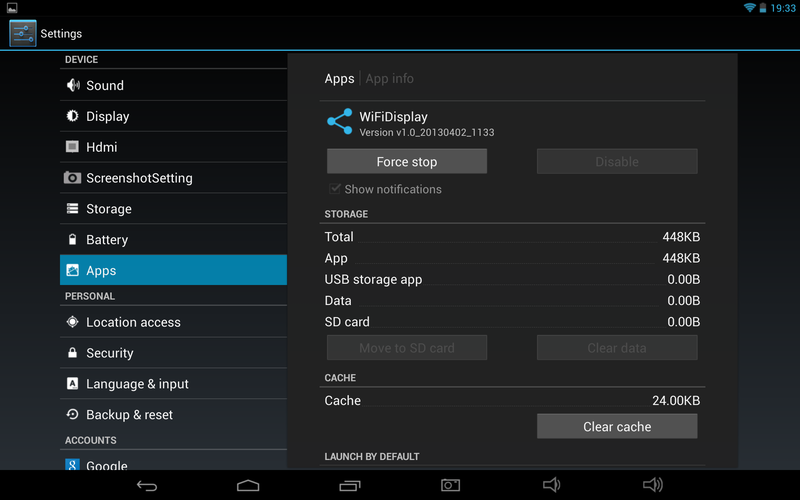 Also in the application "WifiDisplay" a settings option is missing. If I hit any button - "Search", "Available Devices" or "Paired displays", there is no response. That application has no option to uninstall it. It looks like is embedded in the root or how to say (I am a pure amateur no IT education just a poor user) so sorry for that description. Some people mentioned that I must have faulty WiFi module (hardware problem). I don't think so because the performance and behaviour is little different under different firmwares. And finally there are moments (especially after upload of a new firmware - almost no applications installed) when the wifi worked quite fast. My suspicion is that wirelessdisplay is somehow responsible for issues with radio part of the Pipo tablet. 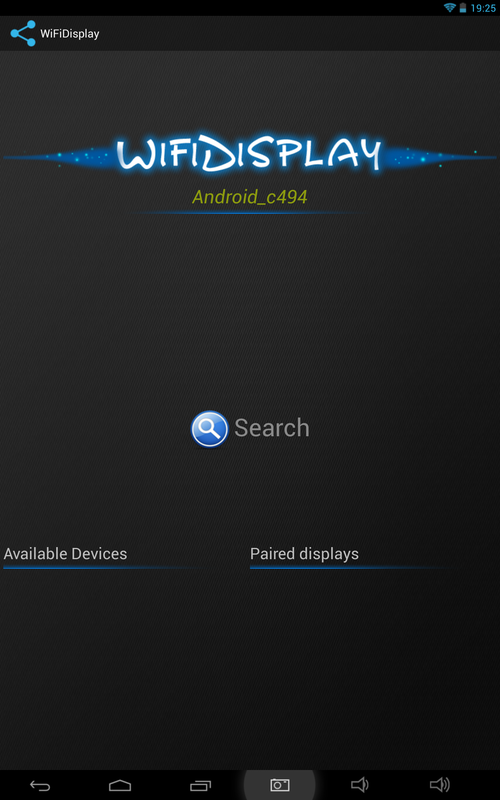 I have tried to find some information or source of that application (wirelessdisplay apk), but not too much success. It will be nice if the users who had/have problems with wifi or 3g connection can report about they experience with the wireless display. Another direction (I have read somewhere) is related to security options of wifi connection - if the infrastructure is secured by PSK then there might be a problem with WiFi connection. Anyway I am really very very annoyed with all these problems because without the reliable internet connection the tablet is almost useless. And that is very disappointing because on the other hand the PIPO M9Pro is a very nice tablet. You can safely remove the WiFi Displayapp without any issues using RootUninstaller it helps a little bit with the wifi issue. I already sent an email to the PIPO, and they said that the problem is in my router, I was asked to reboot and change the channel, was at 6, moved to 11, still the same thing. With this new update, the wifi remained more stable, but the problem still continues. I opted to install the original firmware without root, because it is the only one that remained stable. I recommend you to root it after your tablet is stabilised. If that is what you want just ignore the "not registered" message that crops up till you root it with the software that I had given somehere else in the PiPo forums. Or else you will get into trouble with the registering your device which will render it useless at the home screen dont enter any numbers in the registration request just click LATER. Once you have checked that (you belief the factory ROM to be stable on WiFi) you have to remove the Centificate Centerfrom your device (how else for you to do but ROOT it). Good luck to your endevour. Regarding the answer / recommendation from Pipo to switch router to different channel is useless advice. How you will do at public place / hotel / and lot off other places where you no chance to change router settings. Anyway I have tried to connect the tablet at different places (all had very good strenght of the signal) and the difference in tablet's behaviour was very small. During the weekend I will try to load the latest original firmware and I will report how it developed. Somebody in a different forum topic was commenting our effort to solve radio problems via software changes as useless and he stated that it must be a problem with antenna. I dont think so because sometimes I had very good connection and speed for a while and under the same conditions I had problems to connect or connection was cyclically switched on and off. So I still believe that must be a software problem. I haven't read enough reports on the subject to understand if it's a software or hardware issue. Latest PiPO firmware mentions some WiFI optimizations, it will maybe help. You are really great. Now downloading and will try it definitely. The new firmware successfully installed. Starting the settings and testings. The first issues, the positive one, I was able to register to mobile operator's network (with the previous version I had not). The negative one, I have at home very limited 3g connection and when it becomes quite weak edge connection I am still experiencing the frozen display. Wifi, first applications were downloaded quite fast but after installing some basic google applications it started again to work with some breaks, looks unstable. Wireless display - still no chance to switch off, WiFiDisplay application looks as a different version, but no visible changes in menus and behaviour. So I am still remaining suspicious about influence of Miracast - wireless display to the wifi performance. I am pretty exhausted today, so I will continue testing during the weekend. Anyway many thanks for your effort. You are doing the great job and service for us. I also have wi-fi problems with M9 pro 3g tablet. Even with the last firmware installed (20131023) the problem remain. I believe it is a common problem with this tablet and PIPO staff have to resolve it or to return our money back. I discussed several time with them and they said to be patience as with OTA version of the firmware these problems shall be fixed (not true). As you said without internet connection the tablet is almost useless. Maybe all of us which have this problem have to addressed PIPO (aileen <aileen@pipomall.com>) and claim back for our money. In this way maybe they shall fixed the wi-fi problem. I will test this last update that came out. The frustrating thing is that I lose all the apps I have installed, you'll probably have to reinstall. For me it does not pay me to return to china, because the freight will be very expensive for me. I was happy thinking I was going to buy something better than a samsung, I regretted. It is a good tablet, but for a quad-core I expected more. update wont help you anyway. I will test. Had people who were having the same problem and decided to upgrade. I saw your link, but I had difficulty even with google translator. I believe we should not have updated and from Russian to Portuguese. You made ​​some type of welding or replaced any parts? Before this procedure, i've spent almost month on testing any kind of firmware from the earlier builds till 30/10/13, including custom rom, from here. The result was almost the same, on different version wifi worked better, longer, worse and than drops again. Nothing has changed. I've open a dispute and should send a tablet to China back to seller on this Saturday. But suddenly, i've decided to look inside of the tablet and was shocked, how terrible it was built. I've saw many of this, but didn't think, that pipo use to sell a hand made product, that are assembled buy poor people and children (probably, that has no experience at all). Because it was a wifi glitch, i've decided to check antennas first and did not missed. The antennas are in short circuit. In my case - two from three. You know, every russian has in apartment a bottle of vodka, multimeter, soldering iron, solder and rosin. So i've sealed-off two antennas and voila. The trouble is in the antenna wires, they are too thin, and when a crappy hand soldering them to the main board, insulation melts and we have a short circuit. 2. resolve the problem buy yourself or go to nearest service center, that can solder a wire. The howto picture is attached above.